Treats arrayed just before guests were allowed to take samples. 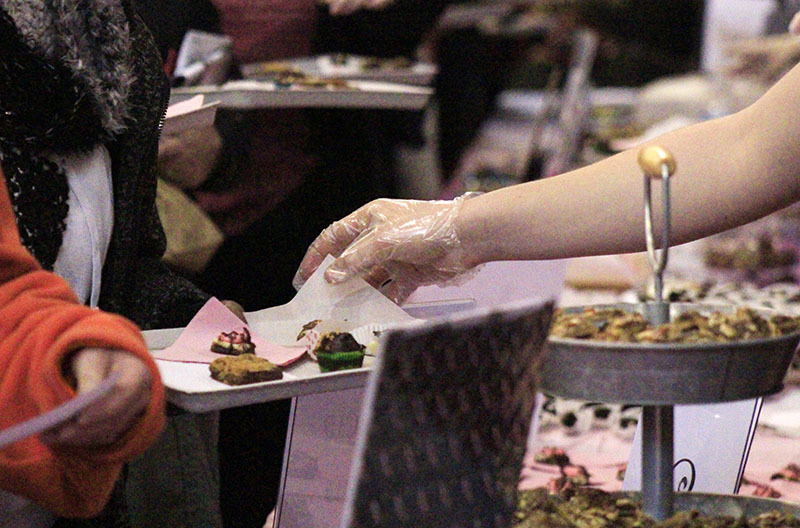 Most contestants ran out of samples before the event was over. 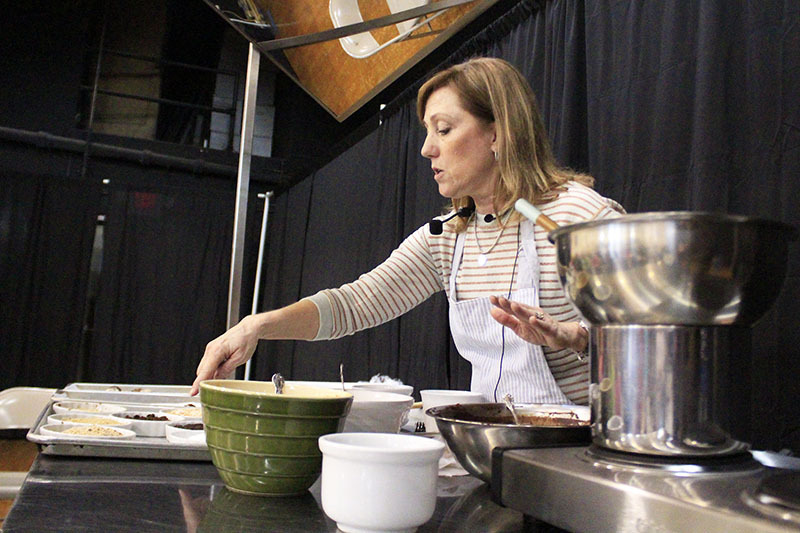 Barbara Haggerty demonstrates how to make truffles at the Chocolate Fest. 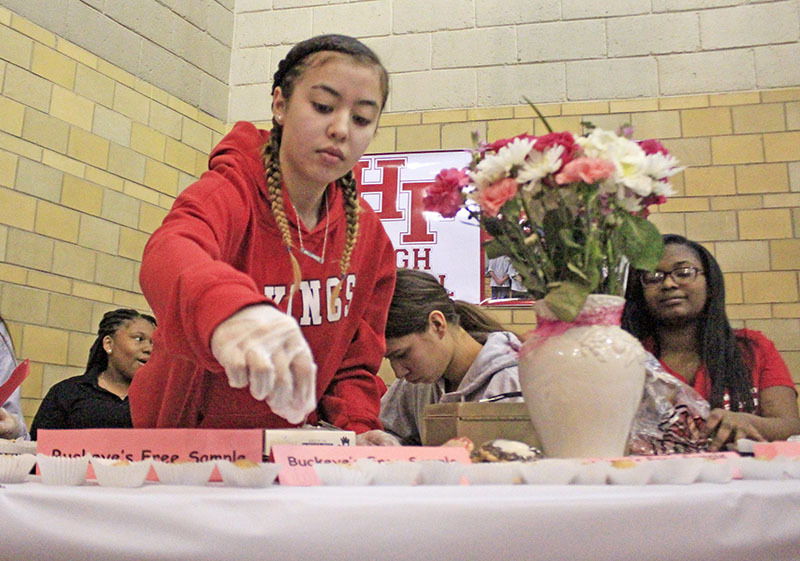 Belinda Gutierrez replenishes samples of buckeyes, a peanut-butter and chocolate treat prepared by the Homewood-Flossmoor High School advanced culinary class. 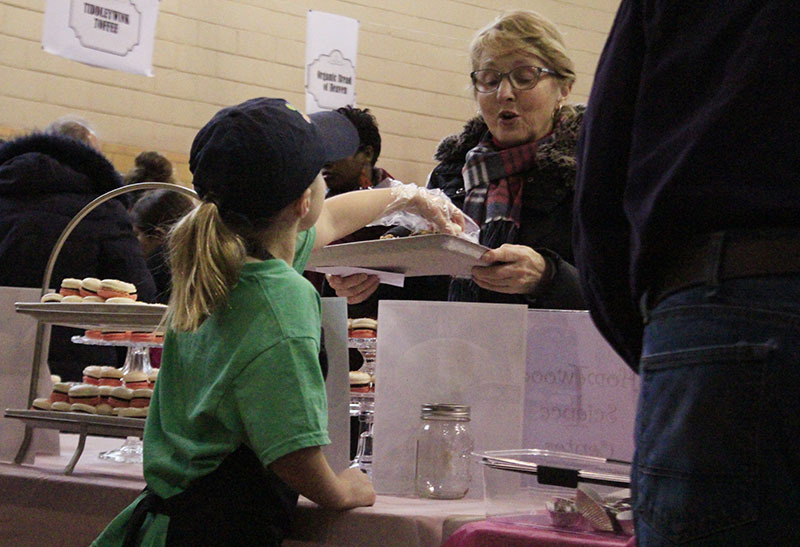 Kammi Nelson serves a Chocolate Fest visitor. 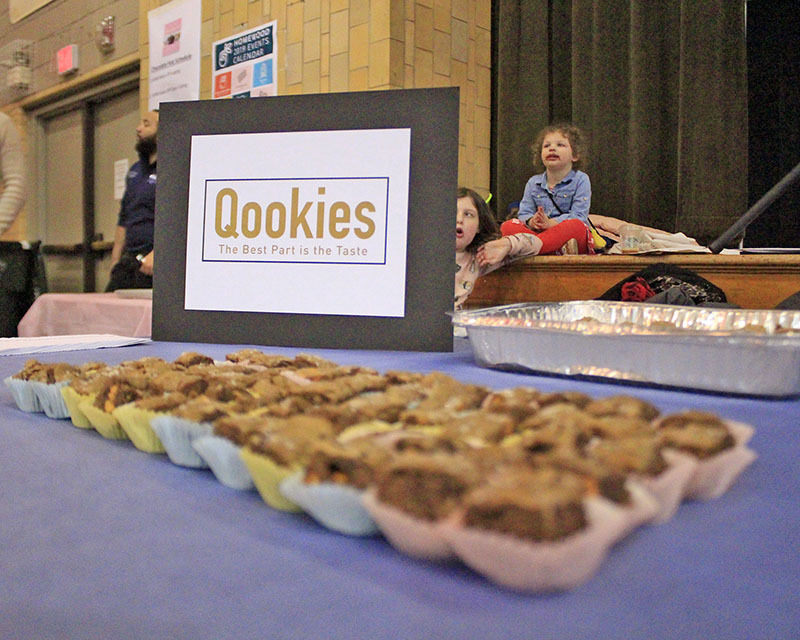 Nick Quirke offered Qookies as his entry in the Chocolate Fest Bake-Off. 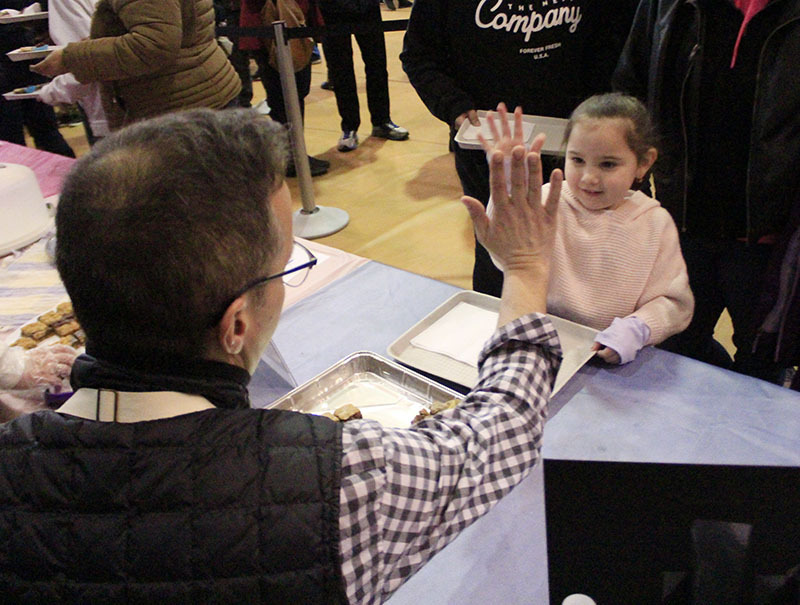 Alani Garcia of Glenwood, who was at Chocolate Fest with her mom, Jamina Garcia, gives baker Nick Quirke a high five before receiving a "qookie." 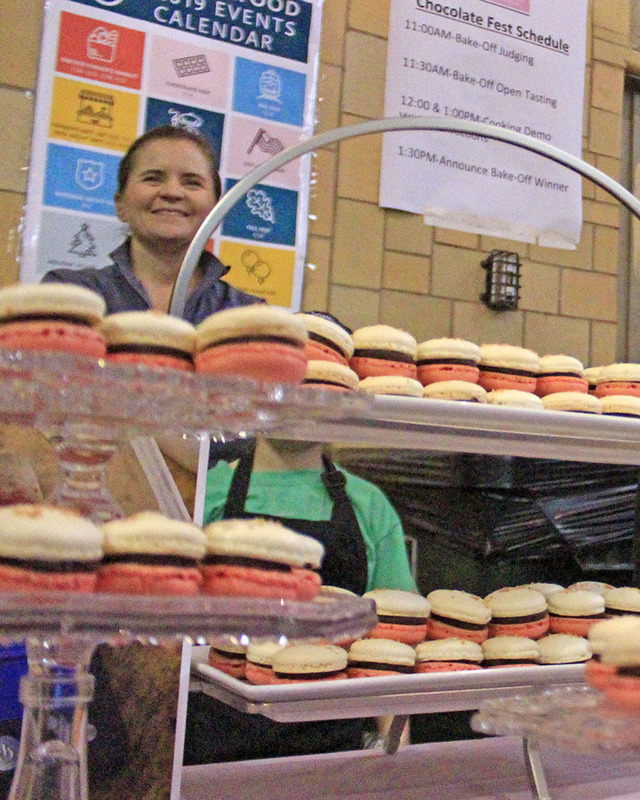 Michelle Nelson, whose macarons took second place in the Bake-Off on behalf of the Homewood Science Center, waits for guests to arrive for samples. Master of ceremonies Troy O'Quinn introduces Mayor Richard Hofeld and Phil Kosanovich of the Community Relations Committee before announcing the winners of the Bake-Off competition. 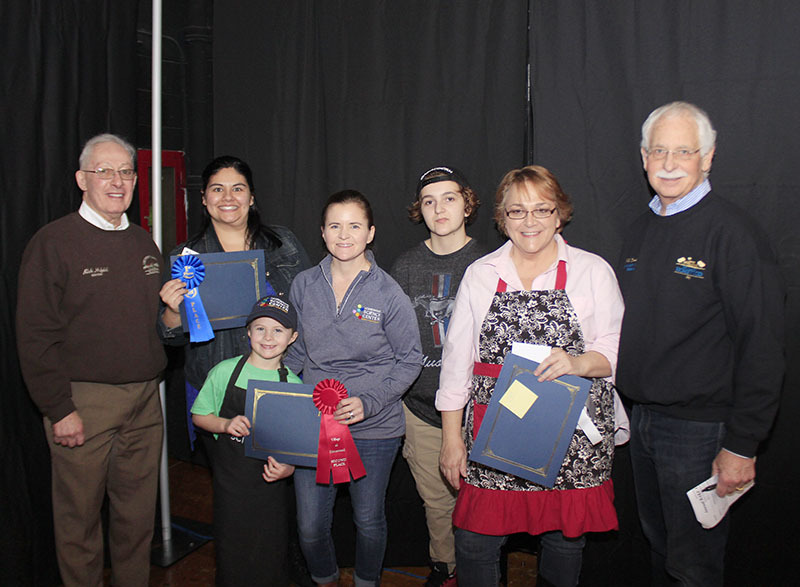 From left, Homewood Mayor Richard Hofeld poses with Bake-Off winners Jessica Josvai, first place; Michelle and Kammi Nelson, second place; Hailey and Patricia Stepp, third place; and Phil Kosanovich of the Homewood Community Relations Committee. From left, Mark Leschuck of Homewood; Lisa Leschuck of Cheyenne, Wyoming; Polly Landgraf of Detroit, Michigan; and Susan Wassman of Naperville pose for a photo. 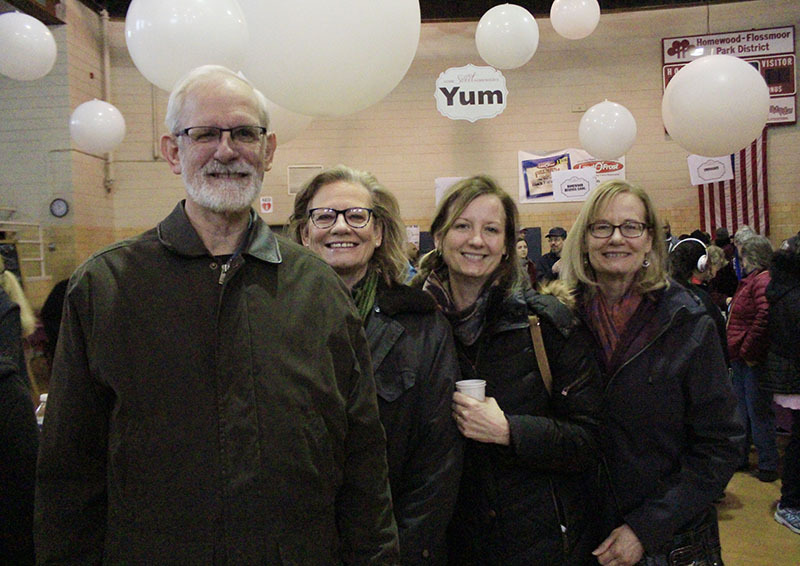 The three women said they were visiting their hometown of Homewood for the chocolate — and to see brother Mark. 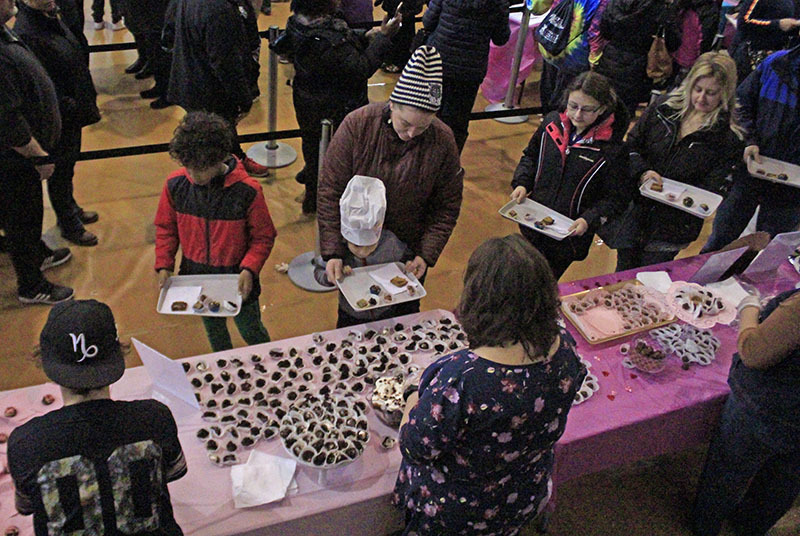 A large crowd gathered at the Homewood-Flossmoor Park District Auditorium Saturday, Feb. 16, ready for a sweet experience. 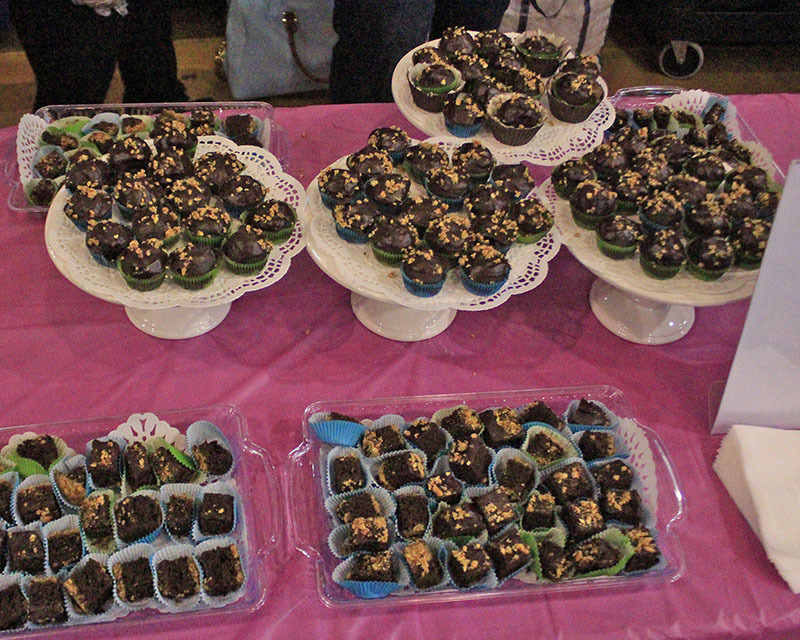 And that’s exactly what they got at a fun annual event centered on chocolate — the Homewood Chocolate Fest. 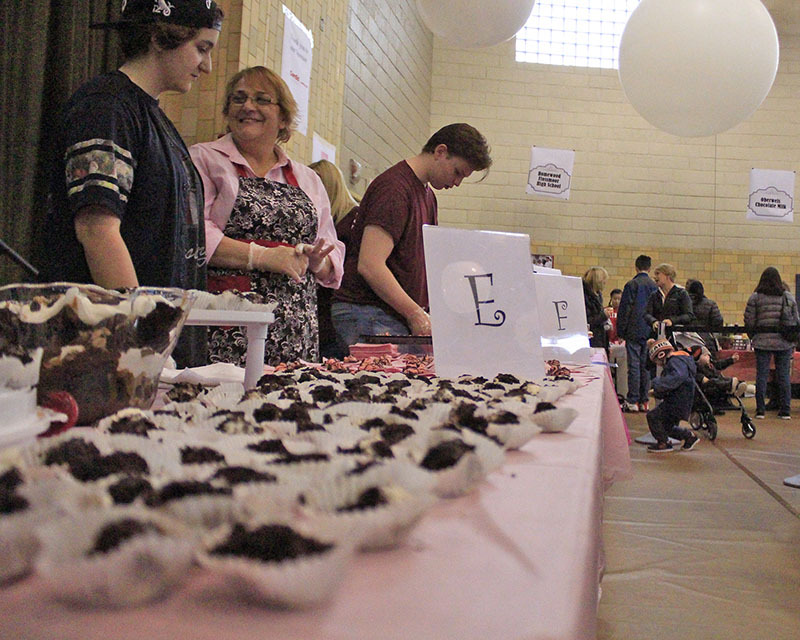 Chocolate lovers had their fill of “sweetastic,” “delicious,” “terrific” treats at Homewood’s 15th annual Chocolate Fest on Saturday, Feb. 18. 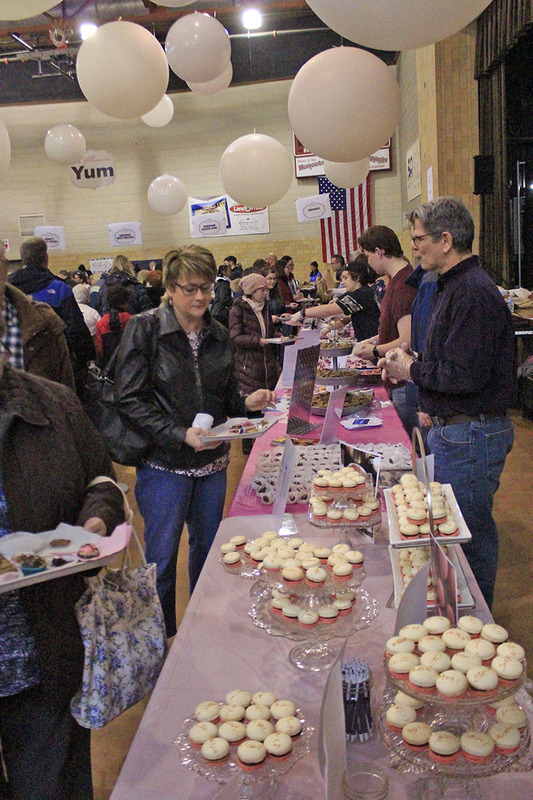 It didn’t matter if they left the Homewood Auditorium with mouth-watering treats from the dozens of vendors or got in line for samples provided by the chocolate bake-off contestants. The consensus was: It was all good! 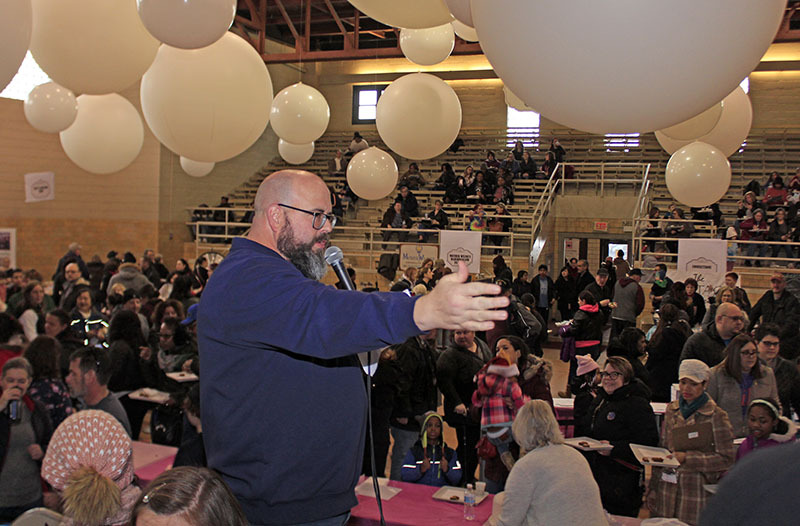 The Village of Homewood will be a chocoholic's paradise 11 a.m. to 2 p.m. on Feb. 20 as it hosts the 14th annual Homewood Chocolate Fest. 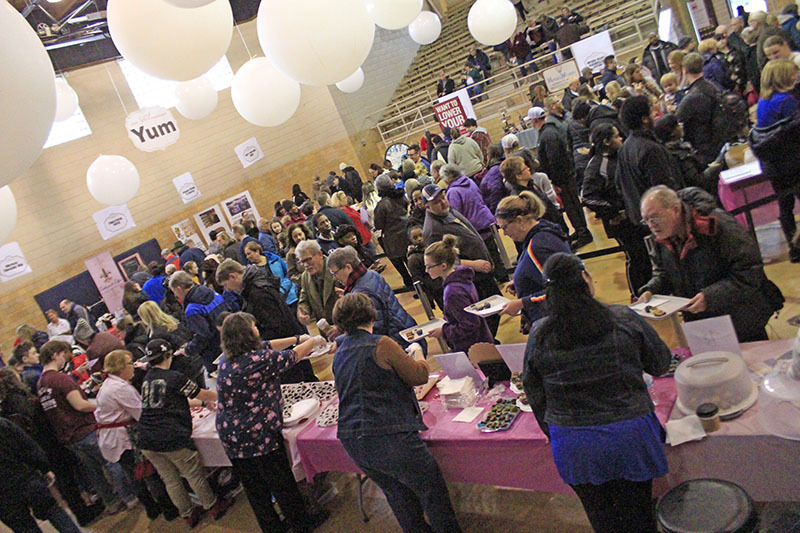 This year's festival will feature baking demonstrations, children's activities, a science demonstration, vendor booths and the annual Chocolate Bake-Off Contest.